It's Confirmed ! 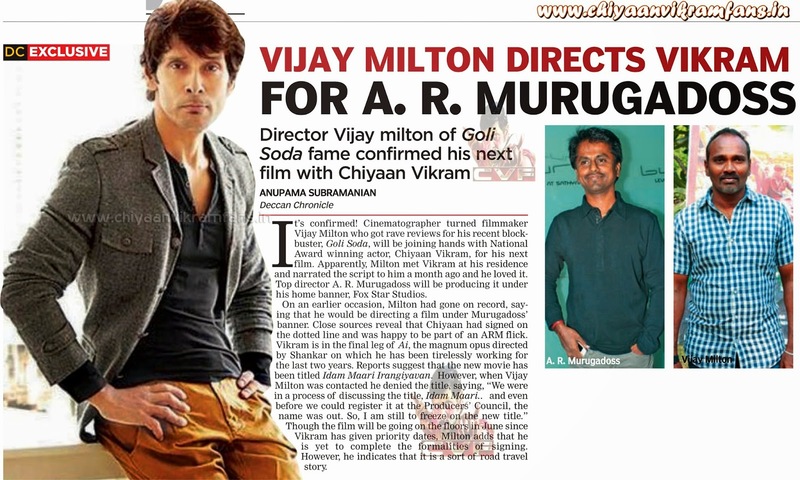 Cinematographer turned filmmaker Vijay Milton who got rave reviews for his recent block-buster, Goli Soda, will be joining hands with National Award winning actor, Chiyaan Vikram for his next film. Apparently, Milton met Vikram at his residence and narrated the script to him a month ago and he loved it. Top director A.R Murugadoss will be producing it under his home banner, Fox Star Studios. On an earlier occasion, Milton had gone on record, saying that he would be directing a film under Murugadoss' banner. Close sources reveal that Chiyaan had signed on the dotted line and was happy to be part of an ARM flick. Vikram is in the final leg of Ai, the magnum opus directed by Shankar on which he has been tirelessly working for the last two years. Reports suggest that the new movie has been titled Idam Maari Irangiyavan. However, when Vijay Milton was contacted he denied the title saying, "We were in a process of discussing the title, Idam Maari.. and even before we could register it at the Producers council, the name was out. So, I am still to freeze on the new title.'' Though the film will going on the floors in June since Vikram has given priority dates, Milton adds that he is yet to complete the formalities of signing. However, he indicates that it is a sort of road travel story.